Each year, over 600,000 passengers will fly to and from Berlin Tempelhof Airport (THF), making this a small, but significant local facility. Although the future of Tempelhof Airport is limited, since it is closing in October 2008 due to unprofitability, it continues to serve the city of Berlin with mainly commuter flights. Tempelhof's main advantage is its extremely central location, which is a mere 3 km / 2 miles from the Potsdamer Platz, close to the heart of Berlin city centre. Also near to the airport are Berlin's suburbs of Baumschulenweg, Neukölln, Schöneberg and the Volkspark Hasenheide, along with the busy autobahn A1. It is hoped that Tempelhof Airport's imposing and historical terminal building can be repurposed in another guise. Passengers at Berlin Tempelhof Airport (THF) will find plenty of transport options on hand. These include airport buses, U-Bahn trains, taxi cabs and limousines. Tempelhof Airport is centred around the Platz der Luftbrücke and alongside the Templehofer Damm, with public transport linking the suburbs of Friedrichshain, Kreuzberg and Mitte, which is the city's most central neighbourhood and literally translates as 'the centre'. Mitte is where many of Berlin's most historic buildings reside, including the 13th-century Marienkirche and the Nikolaiviertel area, next to the banks of the winding River Spree. Germany's proud capital city has undergone something of a transformation in recent years and whilst Berlin remains steeped in history, it has grown into a truly modern, leading city. The Berlin skyline is dominated by the towering Fernsehturm Television Tower, which has been the city's tallest structure since being built in 1969. The centrally located Tempelhof Airport (THF) is close to the heart of the action in Berlin and the nearby animated Potsdamer Platz is the place to be seen and very much a symbol of 'New Berlin'. Once a busy traffic hub, today the Potsdamer Platz is dominated by entertainment venues, such as the Daimler City, the Sony Centre, street cafes and various multi-screen cinemas. 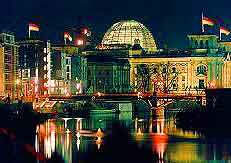 Other famous highlights in the city include Checkpoint Charlie, the Kulturforum Museums, Tiergarten Park, and the magnificent Reichstag German parliament building, which dates back to 1894. Tempelhof Airport (THF) is at its busiest between May and September, Berlin's main tourist season and when many of the city's biggest events take place. These include the enormous Karnival del Kulturen at the end of May, when the streets are filled with processions of carnival floats and costumed dancers.